More organizations are looking to strategically use data to guide their data center management practices, but few know how to get started or what to track—especially when it comes to capacity, one of the most challenging data center operational constraints. Ascierto shared these insights and other thoughts as she identified data center Key Performance Indicators (KPIs) and drivers for DCIM deployments during the first segment of our webinar “Top Data Center KPIs to Optimize Capacity Utilization.” She also discussed how more data centers are attempting to integrate and analyze DCIM data, maximize its use, and become increasingly data driven. These efforts reduce risk, support business agility, and improve capacity utilization and planning. Following Ascierto’s discussion of data center KPIs and how organizations can make the most of their DCIM data, Sunbird’s own Samer Nassoura, DCIM Solution Architect, shared real-world examples of data center business intelligence charts and how to interact with the data for specific use cases. Nassoura was joined by Joseph Keena, Data Center Operations, University of Florida Health Shands. Responsible for data center day-to-day operations as well as spearheading the implementation of new technologies, Keena shared his own experience with the practical applications of these charts and metrics. With the diverse perspectives shared during the webinar, attendees gained real-world, practical tips from experts who understand using DCIM for smarter, more effective data center management. 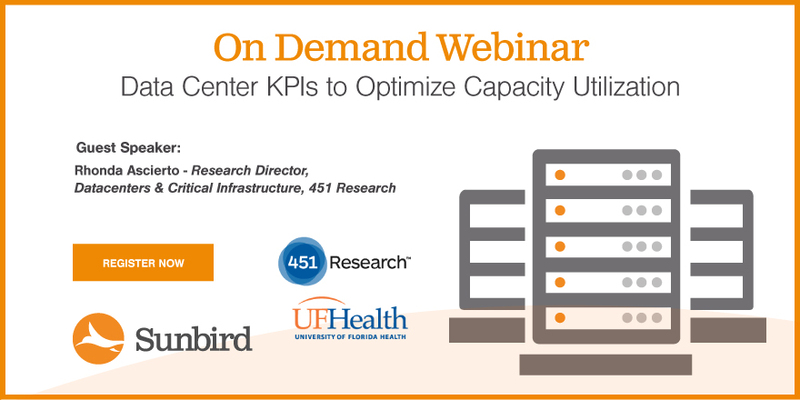 Register to watch the webinar recording or read on for just a few of the space and power capacity management KPIs hand-selected by our data center experts on the webinar. Rack units (RUs) fragmentation is one of Keena’s favorite metrics because it lets him see at a glance how many “big chunks of Us” are available to install items or how fragmented his data center may be. This chart shows the number of items that can be installed in a selected location if all the items had an RU height as indicated by the bar label along the x-axis. Each bar represents a specific RU size, and the y-axis lets you know how many assets can be installed of that size to fill it to capacity. As the size of the equipment increases, your capacity for it decreases. Ideally, you want the bar graphs to decline smoothly. Otherwise, as the equipment gets larger, you may run out of space because the space that you have is fragmented into smaller RUs. Knowing the age of the assets in your data center can help you determine how old your hardware is and when you should look to begin your next refresh cycle. When interacting with the data, it’s helpful to be able to sort the data by the type of equipment you’re looking for—cabinet, PDU, data panel, device, or power outlet—and by purchase date, installation date, contract start and end dates, and other date-specific parameters. The ability to drill down to the details driving the chart enables you to slice and dice the data further by asset information like make and model or by more complex parameters like effective and potential power. What-If analysis charts for space and power capacity can help you determine the net impact of additions and decommissions on your data center without impacting equipment in use. Conducting what-if analysis on a per-project basis gives you the flexibility to add the same equipment in different combinations and locations to multiple projects so you can better determine when you will run out of capacity and how long you can delay capital expenditures. Keena plans to use what-if analysis more with upper management. “It provides that visual impact to them, where if you talk about rack Us or cabinets, it doesn’t have the same impact." Multiple power capacity charts can be useful for identifying power consumption trends and for analysis to determine if any equipment is no longer working as intended. Using DCIM software to collect and analyze this data ensures greater accuracy since the actual readings are collected directly from the devices in your data center at your specified intervals. A location’s total active power, for example, provides the facility’s total power consumption. Lines representing the minimum, maximum, and average combined with the ability to specify the time period—such as the previous hour, day, week, month, or year—at hourly, daily, or monthly granularity readings make it easy to identify spikes and other changes in power consumption. Tracking the stranded power per cabinet, aisle, or row can help you better utilize your power capacity. Obtaining the stranded power metric is a simple matter of taking the difference between the budgeted value (the sum of all power consuming items' effective power within the specified location) and the actual value (all items using the average over the past hour at raw granularity). On the flip side, it can also be dangerous if your actual power is greater than the budgeted value. According to Nassoura, having equipment draw more power than expected could lead to issues of oversubscribing the capacity of a cabinet and even having circuit breakers trip. With data centers becoming increasingly data driven to improve the efficiency of space and capacity utilization, it’s more critical than ever for data center professionals to be able to integrate, analyze, and act on the KPIs that have the most impact for their organizations. Whether you are just starting to identify your data center management KPIs, looking to improve your current capacity utilization efforts, or planning your next data center projects, these tips and insights from data center experts can help you maximize the value of your DCIM data. Want more ways to explore data center KPIs and improve your data center management today? Watch the webinar here, and then test drive Sunbird’s DCIM software for yourself today.